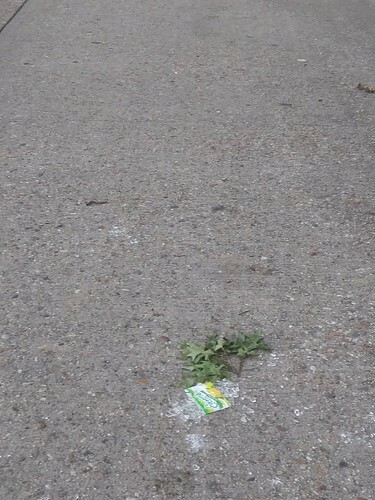 Broken glass bottle on 3rd Street NW on the interim route of the Metropolitan Branch Trail, adjacent to Fort Slocum Park. There has been a fair amount of press coverage about the "new" phenomenon of "plogging," where runners pick up litter while they run. -- "Plogging' Swedish fitness craze is coming to the US," Washington Post; "It's like jogging, but better for the environment. 'Plogging' has come to Miami," Miami Herald). Mayor of DC Muriel Bowser even did a plogging event as part of Earth Day ("DPR Celebrates Earth Day with Citywide Plogging and More," DC DPR press release). As a former runner, I can't see doing that because the frequent starts and stops would be hard on the body, and hard to recover from in terms of maintaining a decent pace and form while you run. But I do pick up litter, recyclable bottles and cans mostly, while I bike. Maybe there is a preponderance of litter and it looks terrible. Or there are cans or bottles in the gutter while I am stopped at an intersection waiting for the traffic signal to change. I tend to deposit such in residential waste recycling cans, although here and there in commercial districts there are also separate waste cans for recycling, usually painted blue, although there is a variant type in the NoMA district. For the most part, given the number of flat tires I have experienced over the 28 years I have bicycled in DC, I almost always stop, "maintaining my pace or not," to pick up glass bottles discarded in the roadway because they will end up broken and that increases the likelihood of a flat tire for a cyclist. … sadly, I rarely ever see other cyclists pick up litter.